For the party's traditional vote bank -- traders -- demonetisation was a 'political betrayal,' reports Radhika Ramaseshan. Manoj Kucchal, a hardware vendor in Bijnor's commercial hub, Sadar Bazar, looked harassed as he summoned his chartered accountant for the morning session he has been holding since the taxman knocked on his doors. The taxman started sending him alerts after vetting Kucchal's bank accounts to check how much cash was put in it after November 8, the day Prime Minister Narendra Modi demonetised high-value currency notes. "The I-T (income tax) department has served 10 messages on my mobile in the past 10 days. If I do not answer these within 10 days, I will have to pay a penalty of Rs 10,000 per notice. The thing that amuses me is the number of times I have used the figure 10," said Kucchal, who heads the Bijnor district traders association. At Saharanpur, 110 km away, Vivek Minocha, who helms the city's traders forum, is feeling harassed. "The I-T guys are demanding proof for every rupee we put in (to a bank account). The PM himself said once not to probe deposits of up to Rs 2.5 lakh by housewives. The women in my joint family have made deposits. It seems the I-T sleuths will not heed his advice. What do I do?" asked Minocha. In the cities of western Uttar Pradesh, whose economies are sustained mostly by wholesale and retail trading, demonetisation has been a killer. In the absence of large industries at these places, trading in food, agro products, industrial goods and crafts is a major economic contributor and a sizeable employer. Of Saharanpur's 12,172 registered industrial units, medium and large units account for a paltry 32. Bijnor, a smaller place, fares a little better with 281 medium and large industries, of the 6,706 registered units. Apart from agriculture, trade is the other big linkage between the urban and rural economies. This linkage is operationalised by a chain of transactions that has evolved and been micro-tuned over the decades. It has now snapped and looks irreparable for the time to come. Minocha, who supplies innerwear to a predominantly rural clientele, explained how the breakdown happened. "In the 22 years I have been in business, November and December are the peak months for selling thermals and warm underwear. I used to run out of stock. Last year, none of my rural clients picked up stuff. I have materials worth lakhs lying at home. Hot weather has almost set in, but I have no cash to buy summer wear (to sell)." "My clients will seek other suppliers. The wheel has stopped turning for me," he said. 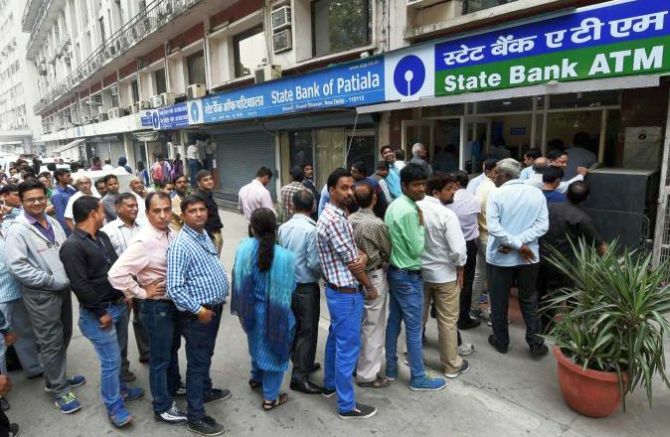 For the traders, demonetisation was a 'political betrayal' by the Bharatiya Janata Party, "the party we grew up with all our lives," rued Mukesh Dutta, Minocha's colleague. Therefore, when Power Minister Piyush Goyal was directed by the BJP brass to 'clarify' to the trading community that the taxman's alerts meant nothing, few, if anybody, took him seriously. Goyal was in Saharanpur last week and told the traders the messages were not notices but 'routine updates' of their savings accounts. A show cause notice, the minister added, is always dispatched by post. "In our presence Goyalji spoke to (Hasmukh) Adhia (the revenue secretary) and ordered him to issue a statement to the effect," said Ishwar Goyal, the BJP's joint campaign coordinator in Saharanpur. "I admit some of our party people had doubts. If there are problems within one's household, it is incumbent on a responsible member to resolve those and that's what Goyalji did." However, Jaswant Batra, a BJP member and the vice-president of the city's traders forum, conceded that the party had held a couple of 'perfunctory' meets with the business community. But this time its leaders were engaging with it "at least" thrice every day. These interactions segregated the traders into three voting groups: The younger ones rooted for the Samajwadi Party; the irate older ones claimed they would opt for NOTA (none of the above option in a voting machine) and a few die-hards resigned themselves to the inevitability of sticking with the BJP. Bijnor transporter Atul Gupta, who voted only for the BJP until 2014, traduced the "notebandi" as Modi's "nasbandi" moment, alluding to how Indira Gandhi's enforcement of the sterilisation programme had turned the masses away from her in the post-Emergency election. He has resolved to "teach the BJP a lesson." Saharanpur's veteran trader Rajendra Gupta said the Samajwadi Party and the Bahujan Samaj Party "put him off" and NOTA was his only option. Jitendra Agarwal, a dealer of disposable crockery and cutlery in Bijnor, gave Modi the benefit of doubt. "The bureaucracy and the banks have let him down. His intention was noble," Agarwal said.